"This is a great side!" Cut 5 squares of aluminum foil 1 1/2 times the size of the ears of corn; place each ear of corn in the center of a piece of foil. Stir mayonnaise, Parmesan cheese, chili powder, ground black pepper, and fresh parsley together in a bowl until it forms a thick paste; rub about 2 tablespoons of the paste over each ear of corn. 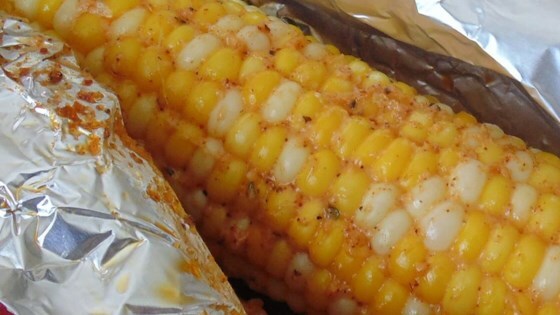 Wrap the aluminum foil around the corn and seal. Arrange corn on a baking sheet. Bake in preheated oven for 10 minutes, turn, and continue baking another 10 minutes. After corn is wrapped in aluminum foil, you can store them in resealable freezer bags in the refrigerator for up to 2 days or in the freezer for up to 1 month. When ready to use, defrost the corn overnight in the refrigerator; then let come to room temperature for about 30 minutes before baking as directed. Waste of parmesan cheese - it sticks to the foil. The taste of chili with corn just wasn't a good combo. Really easy and delicious! I added minced garlic to my mixture. Super tasty! Added an extra 10 mins as well (30 total), and it was perfect. My husband isn't a huge fan of corn, and absolutely loved this...he's asked for it several time since. Great and very easy. I found that mine were a bit under cooked and needed 10 more min. But they were still the best corn on the cob I have ever had.